Fire Protection Systems, Fire Suppression Systems | Clean Agent Systems, Vehicle, Kitchen, Gas Island, Industrial Fryer, Marine, Fire Extinguishers, Alarm Systems, Smoke Detectors, Co2 Systems | Design, Sales, Installation and Maintenance | Interstate Fire Protection, serving all of New England including Maine, New Hampshire, Vermont, Massachusetts and beyond. Use the following links to access different sections of our resource library. On this page you will find news and information related to Interstate Fire Protection. Once you have finished reading this article you can use the links in the sidebar, or the link below, to return to our corporate news page. Click here to return to the news index. 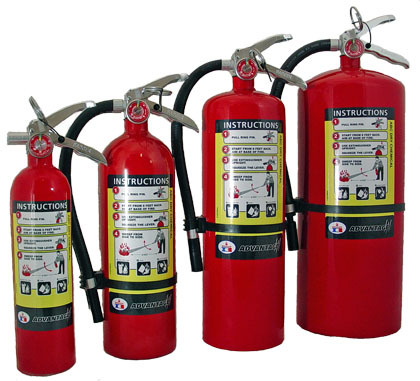 Badger Fire Protection introduces their new Badger Advantage line of portable fire extinguishers specifically designed to exceed the nozzle flow rate of dry chemical for Class “B” (Flammable Liquid) Hazards as mandated by NFPA-10 and NFPA-30. The 2007 edition of NFPA-10 “Portable Fire Extinguishers” and the 2008 edition of NFPA-30 “Flammable Liquid and Combustibles Code” calls for portable fire extinguishers with a minimum capacity of 10 pounds of dry chemical and a minimum nozzle flow rate of one pound per second be placed in the vicinity of pressurized flammable liquids or gas storage and dispensing areas as well as three dimensional or obstacle class “B” hazards. Examples of workplaces where high flow portable extinguishers are required include gas stations, vehicle repair shops, fueling trucks, ships & vessels, aircraft hangers and ramps, off road equipment and vehicles, auto wreckers and propane filling facilities. To learn more about these products and determine whether they are needed in your facility, contact your Interstate Fire Protection professional. Copyright © 2019 Interstate Fire Protection. Design and hosting provided by PHD Consulting, a Maine company.